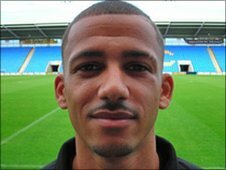 Lionel Ainsworth hit a first-half hat-trick as Shrewsbury thrashed Lincoln. Jon Taylor pounced on a defensive mistake by Gavin McCallum to give the Shrews an early lead only for Ashley Grimes' header to instantly level. Julian Kelly then deflected into his own net to put Town back in front, before Ainsworth's 19-minute treble. He got his first with a low shot after Gavin Hoyte's error, shot home from 12 yards for his second and completed his hat-trick with a wonderful solo goal. Young Liverpool-born midfielder Taylor took his tally to four in three games since making his first start of the season against Burton just a week ago. And Ainsworth weighed in with his first hat-trick for the club - his first goals since September - as Town romped to their biggest away win in 10 years to climb to third in League Two. They had not hit more than five goals in a game away from home since the 7-1 win at Rochdale in February 2001. "They and Bury are the best two sides we've played. "They worked hard, had very good movement and caused us a lot of problems and thoroughly deserved to win. They were better than us, simple as that. "They've got a big squad, a big budget and players who we couldn't afford to get in, but you still have to produce and they did. "It's disappointing on the back of a good run to lose in that manner but hopefully we can bounce back on Saturday." "Some of the movement, passing and the pace we played at was absolute quality. "Lionel Ainsworth's finishing was excellent. It was a new challenge for him up front, but his pace, control and clinical finishing was outstanding. "With two wide players, Matt Harrold the target man up front getting hold of stuff brilliantly, and Ainsworth playing off him, we were scintillating. "There was great service from the midfield too and the back four were as good as I've seen them. Lincoln couldn't live with us." 90:00+1:36 The game is over, as the referee blows his whistle. 90:00+0:29 Shot from just outside the penalty area by Scott Spencer misses to the left of the target. 88:39 Patrick Kanyuka gives away a free kick for an unfair challenge on Craig Disley. Benjamin Smith takes the free kick. 88:39 Booking Patrick Kanyuka is cautioned by the ref for unsporting behaviour. 85:51 Free kick awarded for a foul by Kevin McIntyre on Scott Spencer. Free kick crossed by Gavin McCallum, Shane Cansdell-Sherriff makes a clearance. Outswinging corner taken left-footed by Gavin McCallum from the left by-line. 83:39 Free kick awarded for a foul by Kevin McIntyre on Luke Howell. The free kick is delivered right-footed by Luke Howell from right channel, Nicky Wroe manages to make a clearance. 81:59 Substitution (Shrewsbury) makes a substitution, with Craig Disley coming on for Matt Harrold. 80:44 Drewe Broughton takes a shot. Benjamin Smith makes a save. 79:59 Ian Sharps challenges Drewe Broughton unfairly and gives away a free kick. Direct free kick taken by Julian Kelly. 78:08 Shot by Lionel Ainsworth from 18 yards. Blocked by Gavin Hoyte. 73:14 Daniel Hone challenges Matt Harrold unfairly and gives away a free kick. Mat Sadler restarts play with the free kick. 71:24 Scott Spencer takes a shot. Save made by Benjamin Smith. 70:43 Mark Wright sends in a cross. 68:43 The referee blows for offside. Free kick taken by Trevor Carson. 68:43 Substitution Connor Goldson on for Jermaine Grandison. 65:58 The official flags Drewe Broughton offside. Benjamin Smith restarts play with the free kick. 64:23 Free kick awarded for a foul by Patrick Kanyuka on Matt Harrold. Direct free kick taken by Benjamin Smith. 64:23 Substitution Drewe Broughton comes on in place of Delroy Facey. 64:23 Substitution Scott Spencer comes on in place of Ashley Grimes. 62:24 Jon Taylor takes a outswinging corner. 61:01 Gavin McCallum challenges Jon Taylor unfairly and gives away a free kick. Direct free kick taken by Ian Sharps. 59:44 Jon Taylor gives away a free kick for an unfair challenge on Gavin McCallum. Adam Watts takes the direct free kick. 55:54 Lionel Ainsworth takes a shot. Save made by Trevor Carson. 53:46 Free kick awarded for a foul by Gavin Hoyte on Kevin McIntyre. Direct free kick taken by Shane Cansdell-Sherriff. The official flags Matt Harrold offside. Free kick taken by Trevor Carson. 53:46 Booking Booking for Gavin Hoyte for unsporting behaviour. 50:40 Patrick Kanyuka gives away a free kick for an unfair challenge on Nicky Wroe. Benjamin Smith takes the direct free kick. 45:01 Substitution Patrick Kanyuka replaces Stephen Hunt. 45:01 Substitution (Shrewsbury) makes a substitution, with Kevin McIntyre coming on for David Davies. 45:00+3:12 The half-time whistle blows. 45:00+1:31 Foul by Mark Wright on Gavin Hoyte, free kick awarded. Trevor Carson takes the free kick. 45:00+0:46 Matt Harrold takes a shot. Save made by Trevor Carson. 44:42 The referee blows for offside. Indirect free kick taken by Benjamin Smith. 40:06 Josh O'Keefe produces a right-footed shot from the edge of the box and misses to the right of the target. 39:47 Julian Kelly fouled by Mat Sadler, the ref awards a free kick. Direct free kick taken by Gavin Hoyte. 37:43 Delroy Facey is caught offside. Free kick taken by Benjamin Smith. 36:47 Matt Harrold is caught offside. Indirect free kick taken by Trevor Carson. 34:52 The assist for the goal came from Matt Harrold. 34:52 GOAL - Lionel Ainsworth:Lincoln City 1 - 5 Shrewsbury Lionel Ainsworth scores a goal from just outside the penalty area to the bottom right corner of the goal. Lincoln City 1-5 Shrewsbury. 33:10 Daniel Hone concedes a free kick for a foul on Matt Harrold. Shane Cansdell-Sherriff takes the free kick. 32:37 Matt Harrold produces a right-footed shot from outside the penalty area and misses left. 31:28 Mark Wright produces a right-footed shot from the edge of the box and misses to the right of the target. 30:48 Mark Wright takes a inswinging corner. 29:52 Mark Wright is penalised for handball and concedes a free kick. The free kick is swung in right-footed by Gavin Hoyte. 25:11 Shot from just outside the area by Lionel Ainsworth hits the post. 23:06 Assist on the goal came from Mat Sadler. 23:06 GOAL - Lionel Ainsworth:Lincoln City 1 - 4 Shrewsbury Lionel Ainsworth grabs a goal from the edge of the penalty area to the top left corner of the goal. Lincoln City 1-4 Shrewsbury. 21:40 GOAL - Lionel Ainsworth:Lincoln City 1 - 3 Shrewsbury Lionel Ainsworth finds the net with a goal from inside the penalty box to the bottom right corner of the goal. Lincoln City 1-3 Shrewsbury. 20:02 Ashley Grimes is caught offside. Benjamin Smith takes the indirect free kick. 18:59 Matt Harrold challenges Adam Watts unfairly and gives away a free kick. Trevor Carson takes the free kick. 16:59 Josh O'Keefe gives away a free kick for an unfair challenge on David Davies. Direct free kick taken by Mark Wright. 16:35 Inswinging corner taken right-footed by Mark Wright, clearance by Delroy Facey. 14:20 Julian Kelly has an effort at goal from just inside the box that misses to the left of the goal. 12:01 GOAL - Julian Kelly:Lincoln City 1 - 2 Shrewsbury Own goal by Julian Kelly. Lincoln City 1-2 Shrewsbury. 9:48 Shot from 18 yards from Nicky Wroe. Daniel Hone gets a block in. Inswinging corner taken right-footed by Mark Wright, save by Trevor Carson. Unfair challenge on Trevor Carson by Jon Taylor results in a free kick. Direct free kick taken by Trevor Carson. 6:31 Assist on the goal came from Gavin McCallum. 6:31 GOAL - Ashley Grimes:Lincoln City 1 - 1 Shrewsbury Ashley Grimes grabs a headed goal from close range. Lincoln City 1-1 Shrewsbury. 5:07 GOAL - Jon Taylor:Lincoln City 0 - 1 Shrewsbury Jon Taylor finds the net with a goal from inside the area to the top left corner of the goal. Lincoln City 0-1 Shrewsbury. 4:05 Mark Wright takes a inswinging corner. 3:40 Jon Taylor takes the inswinging corner, clearance made by Julian Kelly.